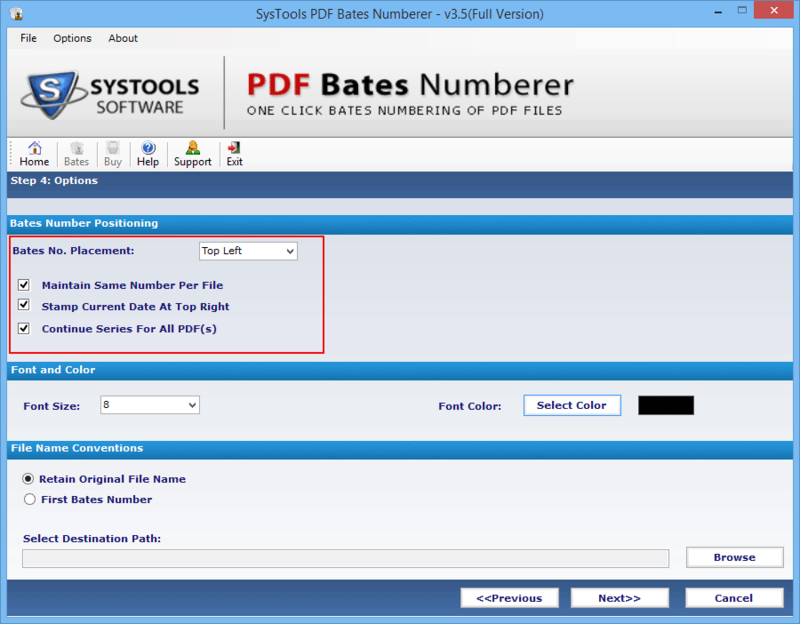 Bates number can be added on all the pages of PDF file even when multiple are present. "Move Down" & "Move Up" allows orderly arrangement of PDF file. There are 3 ways in which page numbers can be put are: insert PDF page number, add PDF page number for file series and print PDF. A check box called "Remove Encryption from PDF file(s)" is provided in the interface to remove encryption from PDF documents and add page numbers. Additional text can be inserted along with Bates number and its position can also be setup accordingly such as at top left/ right and bottom left or right. The position of Bates number can be anywhere; at bottom-left, bottom-right, top-left and top right. Setup at any place, it can be changed anytime on need. Several naming options is provided for saving page number inserted - PDF file. Either original name can be retained or it can be named with first Bates number. At the end, a summary of the overall process such as font size, color, etc. is generated. The status report provides the preview of the PDF file as well. How to Add Bates Number to PDF File? Install the bates numbering software by accepting the terms and conditions on any Windows machines. Then open it when the first screen appears with tab "Bates" on top left corner. Click on "Bates" when another screen comes up with three choices as to how should the Bates number be generated. To proceed select any one of the three alternatives and press Next. 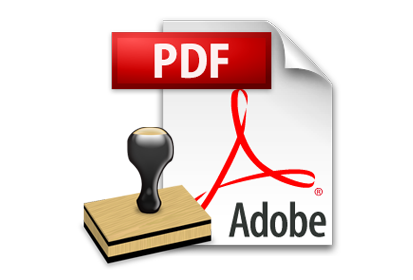 Either add a single PDF file by the option "Add File" or multiple PDF documents with the option "Add Folder". With the latter option, all the stored files are added at once. In the section "Bates Number Format", fill appropriately in the boxes of Suffix, Prefix, Number of Digits, Start Number and Increment By. In the same page having section "Additional Information", enter the text and it position as per desire. Then press the Next button. The next screen that comes up is "Options". Here all the details such as Bates position, its size and color, file naming convention and the destination path should be filled in. After entering all the details, click on "Next" button. Once the tab "Next" is clicked, a summary with status report is generated. In the "Summary" screen click on the tab "Preview" to get a preview of the PDF file(s) with page number added in. Once satisfied with the preview, click on 'Generate' tab. 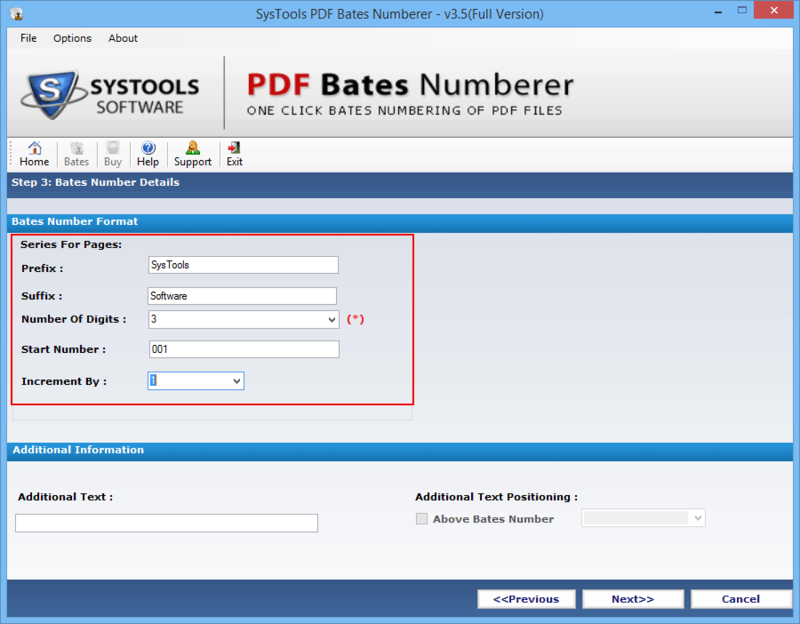 I found the Bates Numberer tool very effective and efficient in adding page numbers to the PDF documents. Moreover, its ability to add Bates to multiple files at once is a truly appreciable. 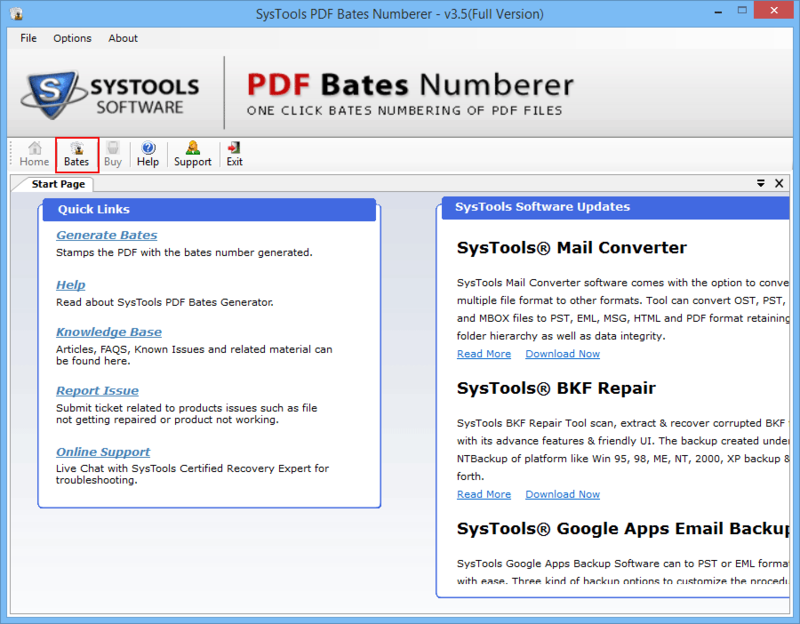 PDF Bates Numberer is a really a marvelous utility with numerous enhanced capabilities featured in it. Working with application was amazing as its interface was simple and very easy to understand. I would really like to thank the team. — Tony Brown - U.K. It is an amazing utility to insert the bates numbering in multple PDF documents with proper squence. I would like to thanks for this essential tool. This Bates Numbering software is working great to add stamp in footer/hearder at multiple PDF file. And the interface of this utlity is such an amaze to used it. Is it possible to insert bates number on PDF documents in batch? 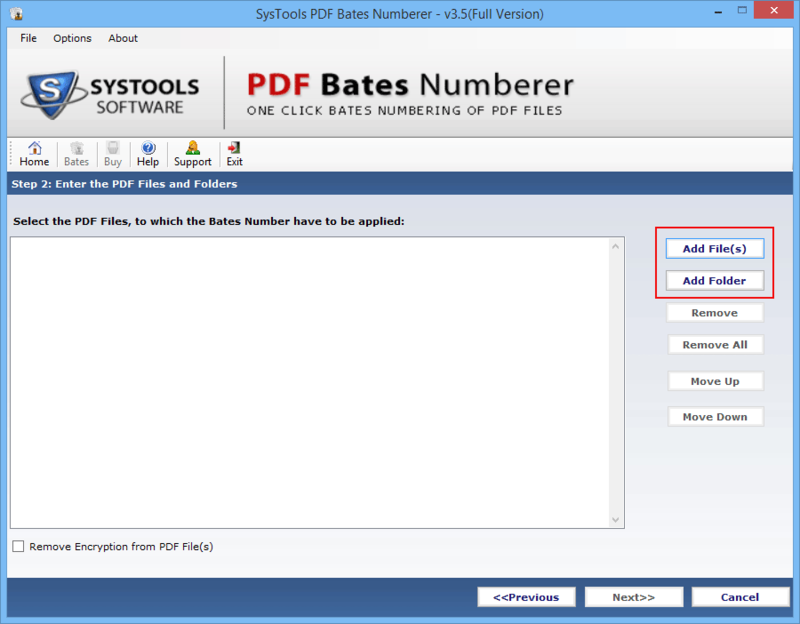 Yes, it is possible to add bates number in batch on PDF file. 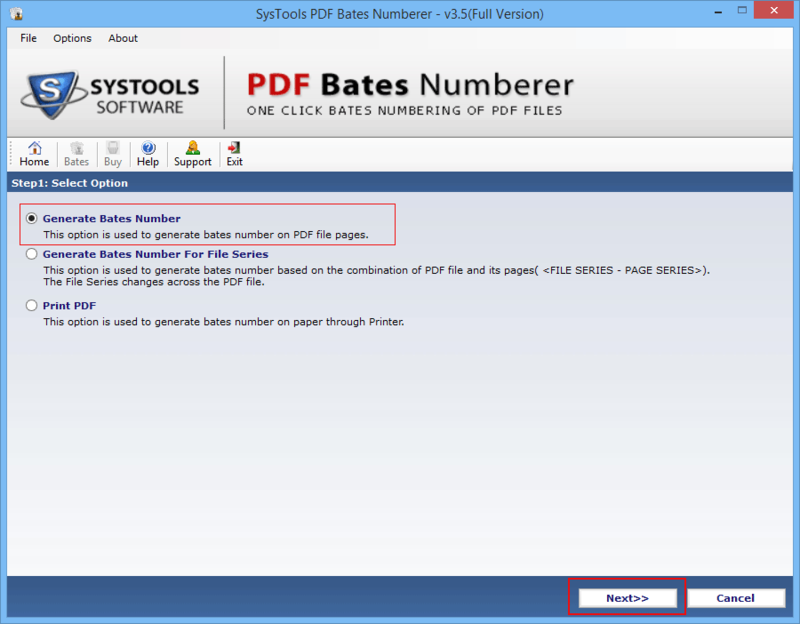 Does this bates numberer tool will work on encrypted PDF file? 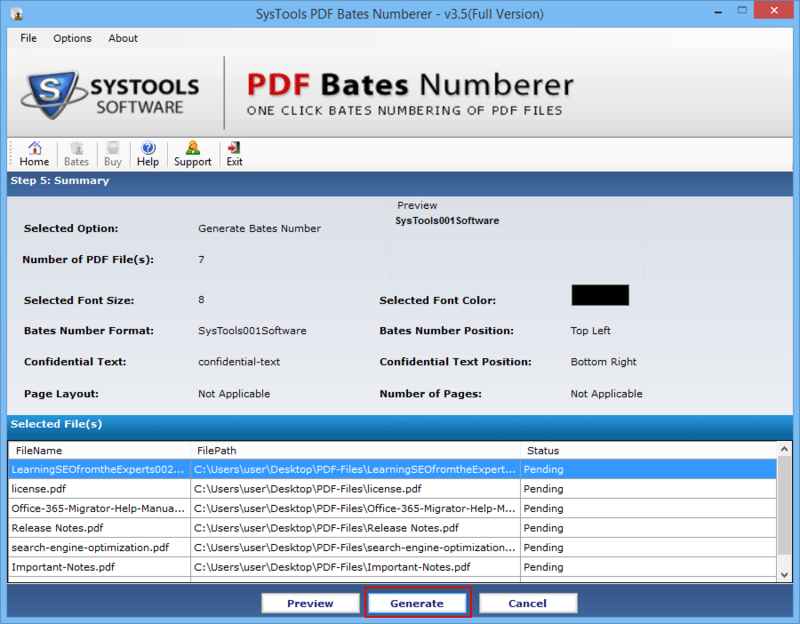 Of course, PDF Bates numberer tool will effectively work on encrypted PDF document. Is there required to install Adobe Acrobat for this tool? Absolutely not, the Bates Numbering Software doesn’t require Adobe Acrobat installation for this application. Is it possible to insert prefix and suffix in PDF documents? Does this tool support Mac OS? No, PDF Bates Numberer software is dedicatedly designed for Windows OS only not for Mac OS.